This week's ingredient.... Cinnamon! I love cinnamon. Of course, I also like a bit of sweetness with it. Even in my Peanut Chicken recipe, I like to add some honey or brown sugar to mellow the taste of this lovely spice. Cinnamon buns would be the perfect choice...but, as some of you may know I am on a workout and strengthening kick right now...so.... can't make those sinful treat...only because I just know I would absolutely feel compelled to eat more than one...okay...probably several....so...I chose this recipe instead. I can hold back with just a loaf...although this loaf is very tasty too!! Guess who sent me this recipe? My financial advisor. What do you suppose that means? 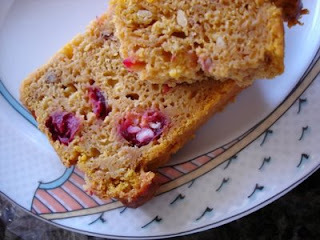 The recipe says it is Cranberry Pumpkin Bread.... but, as usual, ...... to me it is not bread without yeast. Yeh, yeah..I know... many loaves are referred to as breads....but, not by me. 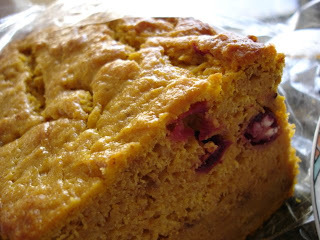 Using frozen cranberries adds a little zing of tartness to the light sweetness of the loaf... I liked it. My brother baked it as well..(said it was too cold outside to do much else and the stove was helping keep the house warm).. .but he used Craisins...he figured they were cheaper, but I can't vouch for that and did enjoy the little tart surprises of non sweetened frozen berries. I never use the full amount of berries in any recipe either..... usually overkill in my guess-timation. I just toss in a handful that looks good to my eye. Remember my usual admonition.... a recipe is just a guideline... add or subtract as you like. Maybe you like more cinnamon...less clovers (yeah, right clovers...ahahha... as if... but, you know I meant cloves didn't ya?) anyway... always your own personal preference. I usually make a recipe to the letter the fist time...then, if it's what I call a "keeper", I tweak it in subsequent attempts... to perfect it for the enjoyment of my very own gustatory receptors....(my taste buds).... .
so...here is my nod to cinnamon for Diana's challenge this week....and I'm darn well referring to mine as a loaf ... so there. Stir together flour, baking powder and soda, cinnamon, cloves and ginger in large bowl. In another bowl, (or mixer bowl) cream together butter and sugar til light and fluffy. Add eggs, one at a time. Mix well. Add pumpkin puree, orange juice, orange zest and vanilla. Add dry ingredients and mix just until moist. Fold in cranberries. This definitely needs a large loaf pan or go for two smaller ones... perhaps check the times after 60 if you use smaller pans. I used my biggest loaf tin which is 9 X 5... and it was full. I do have to say it is a rather dense crumb to this loaf... it is not light and fluffy and really doesn't rise too much, As a matter of fact... the first one I made almost looked like it was not fully cooked ..but around the bottom and outside to halfway up the side...not in the middle where it would normally be if it was undercooked..... .weird... but, it definitely was baked right through. Maybe because it is so huge... it just weighed the lower part of the loaf down ... I'm not sure. Second batch (because I bought a large tin of pumpkin and had enough for seconds) I used two smaller loaf tins...and still there was a slight recurrence of that... but not as bad....don't know what it is. pumpkin, orange and cinnamon flavors....sounds like a winner to me! and the rest of your Recipes on your sidebar are all coaxing me to give them a try too... One of the things we have been spending more time on in the last year has been making better meals.. now that we have time with the building process done, well most all of it anyway... Thanks for sharing!!! What a yummy blog you have here!